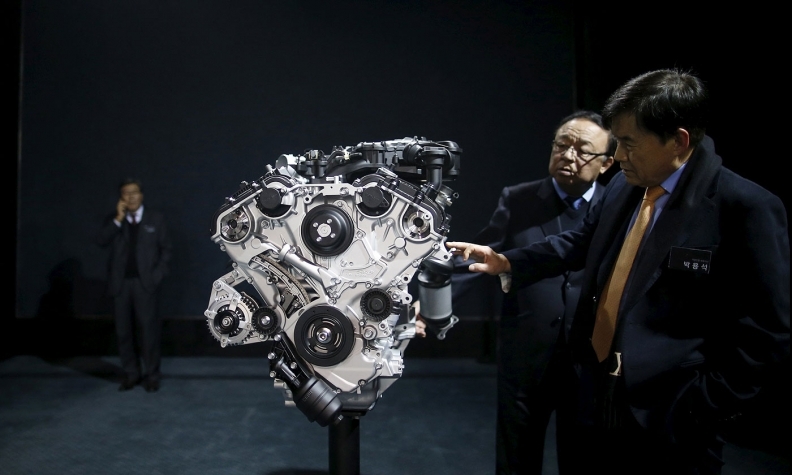 TOKYO -- Genesis, South Korea’s first premium auto brand, unveiled a flagship sedan it promises will compete in the “top of the luxury car market” with “world best” technologies. The Genesis G90, the first of six Genesis nameplates to be rolled out through 2020, was unveiled today in Seoul. Superior safety, comfort and performance are key goals for the Genesis G90, as parent company Hyundai Motor Co. targets a bigger slice of the global luxury segment and its fat profit margins. Some 800 people worked four years on the G90, Hyundai said. 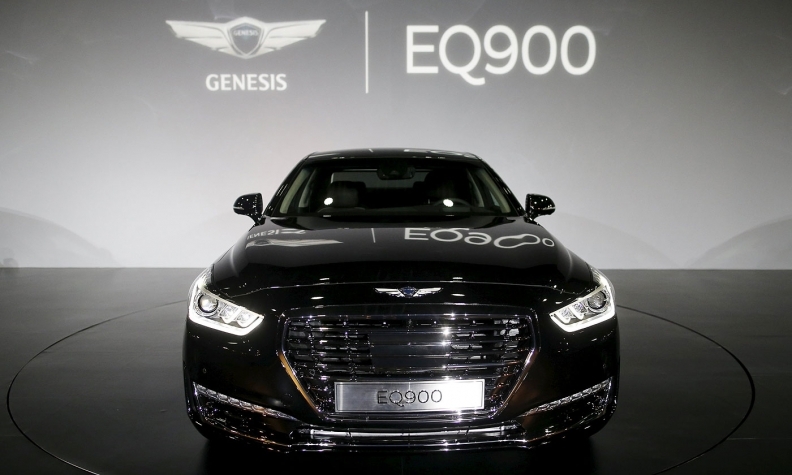 The car, called the EQ900 in Korea, gets a suite of automated driving and safety technologies dubbed Genesis Smart Sense. The package bundles smart cruise control, lane-keeping assist and other technologies that aim to reduce driver fatigue. In Korea, it also gets a feature called Highway Driving Assistance. “This combination of newly developed technologies create a first-class, all-but autonomous driving experience, elevating the G90 to the top of its class,” Hyundai said. The Lambda 3.8 GDI engine that will power the Genesis G9. Under the hood, the G90 gets a choice of three gasoline engines teamed with an eight-speed automatic transmission. The options span a twin-turbo 3.3-liter V-6, a 3.8-liter V-6 or 5.0-liter V-8 powerplant. The V8 can go from 0 to 100 kilometers per hour (0-62 mph) in 5.7 seconds. Engineers tried to deliver sporty and responsive ride and handling by fine tuning the car at Hyundai’s European Test Centre at Germany’s demanding Nürburgring racing circuit. Hyundai Motor announced plans to spin off the Genesis luxury brand in November, after 15 years of refining its luxury cars. The G90 will be the new brand's range-topping model and a successor to the Hyundai Equus, which will be phased out. Hyundai began taking orders in Korea for the G90 on Nov. 23. Its sticker ranges from 73 million won ($61,900) to 117 million won ($99,200). 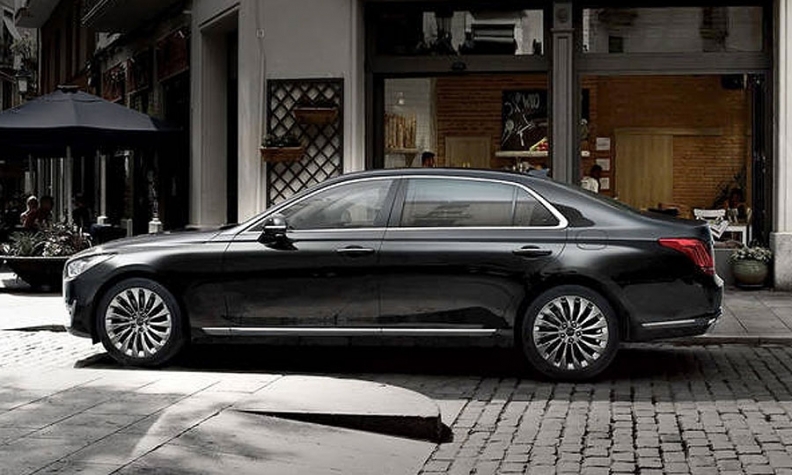 The outgoing Hyundai Equus, by contrast, ranges from 67.8 million won ($57,490) to 143 million won ($121,260). Hyundai has said Genesis will be a stand-alone marque that operates alongside its Hyundai-brand sibling. Genesis cars will initially go on sale in the North American, Korean, Chinese and Middle Eastern markets. The brand will expand its reach to Europe and other parts of Asia as the model range grows. Among the G90’s advanced safety features are an autonomous braking system with pedestrian detection, active blind-spot detection, a driver attention alert system, high-beam assist and an around-view monitor, Hyundai said. Catering to comfort and convenience, Hyundai is deploying what it calls a world-first “Smart Posture Caring System” in the seating. The system automatically determines the overall position of the body to ensure optimal seating position. Indeed, the driver’s seat features 22 ranges of adjustments, while the passenger seats offer 14 ways to personalize. Up front, the center console gets a 12.3-inch high-definition screen. Air conditioning is divided into three zones. To ensure a luxuriously smooth and quiet ride, Hyundai said engineers used sound-absorbing materials throughout the cabin and substructure and applied laminated glass to each window. They even toned down tire noise through a hollow design for the 19-inch alloy wheels that channels air flow more quietly. The result, Hyundai says, is best-in-class sound ratings. Outside, the G90 debuts a new design language called “athletic elegance” that will lend the Genesis lineup a distinctive look. In the G90, the large grille is crowned by the brand’s spread-wing emblem and flanked by sharp LED headlamps that aim to communicate a futuristic aura. A clean character line creases the entire side integrating a long hood and short overhangs. The new brand will be made up of two models initially: The G90 replaces the current Equus, while a G80 succeeds the current Genesis sedan. The third will be a smaller sedan called the G70, followed by a coupe, a midsize crossover and a larger SUV.